During unfavorable conditions, the cytoplasm can solidify, protect the cell from death. Normally, cells are highly active and dynamic: in their liquid interior, called the cytoplasm, countless metabolic processes occur in parallel, proteins and particles jiggle around wildly. If, however, those cells do not get enough nutrients, their energy level drops. This leads to a marked decrease of the cytoplasmic pH -- the cells acidify. In response, cells enter into a kind of standby mode, which enables them to survive. A team of researchers from Dresden, Germany, have found out that the cytoplasm of these seemingly dead cells changes its consistency from liquid to solid. Thereby, they protect the sensitive structures in the cellular interior. Cells can enter into a kind of standby mode -- called dormancy -- when confronted with unfavorable conditions such as nutrient deprivation. In this state, cells drastically reduce their metabolism and shut down growth and cell division. In extreme cases, such cells are hardly or not at all distinguishable from dead cells -- and yet they can re-emerge from this state unharmed and continue to grow and divide when conditions in their environment improve. Munder and colleagues from Dresden (Germany) under supervision of Simon Alberti wanted to understand how cells switch on and off the standby mode. 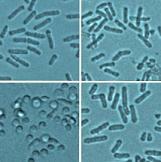 They focused their efforts on yeast cells, which they observed during starvation. Their observation: The cytoplasm loses its dynamics, cell organelles and particles slow down, and many proteins form large, microscopically visible structures. It seems as if the cytoplasm changes its consistency in response to nutrient deprivation. And indeed: a closer look with highly sensitive biophysical methods shows that the material state of the cytoplasm changes from liquid to solid -- the cell enters into a kind of rigor mortis. As it turns out, the cytoplasmic pH, which decreases markedly under starvation conditions, plays a crucial role in this process. Remarkably, the sleeping cells -- in contrast to dead cells -- can also reverse this process. When nutrients are added back, the pH rises again, the cytoplasm fluidizes, and cells continue to grow and divide. The studies of Munder and colleagues show that the state of the cytoplasm is crucial for switching on and off the standby mode: ''Cells seem to have a control mechanism in place, which they use for the regulation of their material properties in response to certain environmental cues, thereby ensuring their survival.'' Thus, it seems to be possible to trick death by shutting down all processes of life in a controlled manner. Whether this trick can be taught to human cells will become clear in the next couple of years. Illustration: Normally, yeast cells are rod-shaped (above). After having their cell wall removed, however, they become spherical (below left). During dormancy (above right) the loss of the cell wall the cells retain their stability and keep their rod-shaped appearance (below right). Credit: MPI f. Molecular Cell Biology and Genetics.